The Internet has become an essential tool for Ecommerce and selling online. Once only a brick and mortar world, the internet has taken over. At one time you could reach thousands of consumers at your local store on the boulevard, today you can reach hundreds of millions across the country and around the world. Websites with shopping carts are ringing up billions of dollars a year, are you taking part in this? If no, why not? Now you can rule out cost of entry! Why not stand out with a well designed, aesthetically pleasing and fully functioning onine store….NOW! At Weston Graphics Internet, we pride ourselves on developing beautiful professional websites that stand out for their elegant design, useful content, and effectiveness in attracting clients, not to mention the nice fit into your budget. Our websites are tailored to reflect the unique and distinctive qualities of our clients and their services. The best part is that you are in full control of your own site. 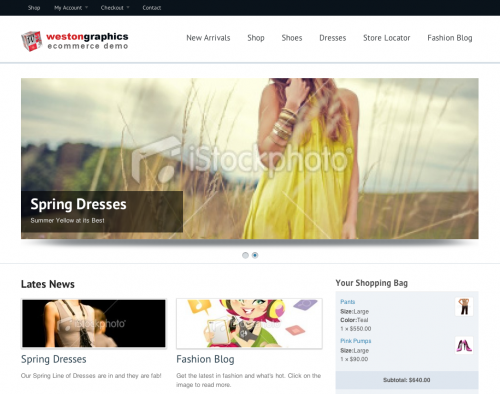 If you can send an email, you can create or edit a page, add products, print invoices, even sell on Facebook with your Weston Graphics designed site. Our design process is an all-inclusive solution. We will assist you in registering a domain if you do not have one, we will let you pick from a gallery of amazing designs and color themes, we will train you on how to add your content if you are a hands on do-it-yourself type, else we will maintain your site completely. We will work together with you to build, manage, and market your website on the Internet. Content Management System, YOU control YOUR site as much or little as you want, we do the rest. Your custom designed website is built using the latest in content management technology and fitted with your choice of many different “skins” to suit your style and can include custom graphics, professional photography, detailed content and your custom logo. With your new website design you can communicate a strong, unified message that will help your clients understand your services, create a unified philosophy, and provide information to keep your clients coming back and attract new clients. ALL FOR THE PRICE OF A MONTHY COFFEE FIX! We do it ALL for you — we completely install a professionally designed website system + a complete online shopping solution that includes your Facebook Fan page shopping cart. This is a fully managed solution, you can control as much or little of the site as you wish. No brain damage here, we have you fill out a quick questionnaire, pick images, we can even use your existing marketing material or site to gather the necessary information, your NEW website will be complete in a few days! Let’s get started today, click your plan below and sign up now!